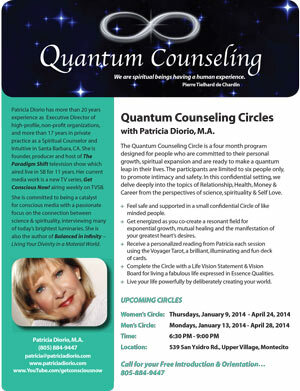 Quantum Counseling Circles with Patricia Diorio, M.A. Creating a fabulous life by employing spiritual principles grounded in quantum physics is not a gender specific conversation. All of us want to live great lives, it's human nature and it's why we are here. In case you haven't notice, women are leading the way into the new millennium. The power of leading with the heart is clear. The Circle is for men who are ready to embrace their hearts and bring them into balance with their minds. This work takes courage and willingness to step out of your comfort zones.